Tanjong Pagar means “cape of stakes” a name that reflects its origins as a fishing village. But there is even more picturesque account of the naming inspired by a local legend. Join us on this new tour to discover who were the early inhabitants of the area, how in the second half of 19th century the area developed into a busy harbor to become a maze of towering offices. 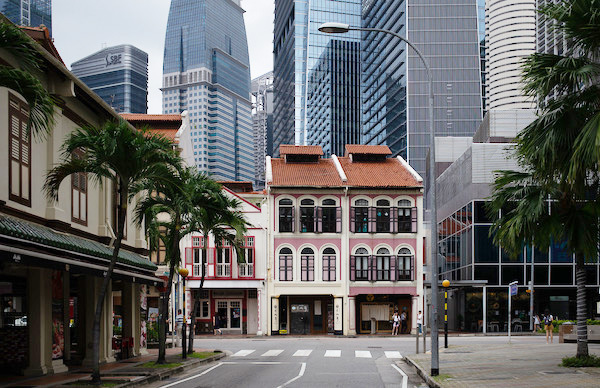 Tanjong Pagar is a melding of big city metropolis and old-world charm. You will enter one of the oldest temples dedicated to worshipping the City God (how fitting) and where, unseen and unknown to many, the wedding rituals of the deceased are carried out (Ghost marriages). You will stop in one of the most authentic hawker centers to sample some local kueh (cakes) of lovely shapes and colors, made from natural ingredients. You will walk through Vanda Miss Joachim Park to learn about the breeder of Singapore’s National Flower to another fascinating Chinese temple (Poo Thor Jee temple). Along former swimming pool on Yan Kit Rd in art deco style we will climb up to the Duxton Plain and the Pinnacle. Sneaking through a secret passage you will discover an array of beautiful shophouses of Duxton Hill, learn all about its past as a nutmeg plantation (Dr. Montgomerie & Gutta Percha story) and the seedy reputation of the neighborhood (opium dens, rickshaw’s lodging). After a coffee break you will find out where the Jinricksha station used to operate and will learn all about this highly popular mode of transport in colonial Singapore. You will end the tour at the cooling interior of Urban Development Authority City Gallery.